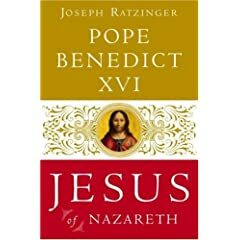 I finally finished Jesus of Nazareth by Pope Benedict. It took a while not just because I’ve been busy this summer, but because it’s a deep book. While easy to read, it’s often profound in what it says, so you have to stop and reflect. There are also times it sends you to the Bible because you want to read the Bible verse Benedict is reading in context. One thing that really struck, especially at the end of the book is how much of an effort Benedict is making to “recapture” the real Jesus from modern “scholars” who seek to redefine Christ in modernist terms. He frequently points out how some exegetes go beyond what the Gospel writers actually record to try to figure out what Jesus really meant, or which sayings attributed to him He “actually” said. Some go so far as to attribute sayings attributed to Christ as having their origins in works written centuries after the Gospels rather than believe the Apostles wrote down what Jesus actually said and that he meant what he said. They, like Thomas Jefferson, prefer to make God in their own image and ignore the parts of the Bible they see as not fitting that mold. This, of course, denies the inerrancy of Scripture, makes Christianity a free for all, and is one step removed from denying the Bible completely. After all, if we can just ignore the parts of it that don’t make sense to us, it’s not a big leap to ignoring the whole thing? He walks us through the Our Father, helping us interpret it in light of the life of Christ. He shows how the Beatitudes are best understood as reorienting the Ten Commandments towards the person of Jesus, who is the new Law, showing us the Face of God for the first time in history. He deals forthrightly with the writings of a confirmed Jew who deals openly and honestly with the teachings of Jesus in light of Jewish tradition and ultimately finds them lacking. Benedict deals respectfully with the writing of this author, but shows where he has a misunderstanding of Christ’s teaching. (Even Moses was only allowed to view only the God’s back, which in my more flippant moments, I think of as God mooning Moses.) He takes us through a cursory glance at the Apostles. (A fuller discussion of the Apostles can be found in this collection of his Wednesday General Audiences on the Apostles.) There is an excellent review of three of Jesus’ parables: The Prodigal Son (which he refers to as The Two Brothers, since the actions of each brother must be reflected upon and learned from), The Good Samaritan (where he right points out that we must identify the Good Samaritan not with a general human being, but with Christ himself) and the Rich man and Lazarus. He also takes us through John’s Gospel and discusses the principal images John uses and what we might learn about Jesus from them and discusses the intimate tie between Peter’s Confession of Jesus as Son of the Living God and the Passion of the Christ, and what the subtle differences in the recoding of it in all four Gospels might mean. This book is definitely worth the read, but be prepared to spend a while with it, but it will be well worth it. Read it prayerfully, not as a textbook and you’ll get even more out of it.